I wouldn’t go so far as to say that Kaspar makes a secret of the way he produces these works, but there’s some mystery to them. To their obviousness, among other things. Both the furniture works and the glass ball works are almost painfully obvious gestures. The one, seemingly endless iterations for no good reason. The other, seemingly endless redundancy for no particularly good reason. In each case: endless, exasperating possibilities. I’m going to be frank, and it’s going to seem inopportune, but you could even say we’re facing as many possibilities as needs allow. As many colorful iPhone cases as you’ll find for sale on Canal Street, as many plastic Happy Meal toys as McDonald’s will produce, as many vintage clothing stores as now span the globe. Then again, my point exactly: How many do we actually need? What is need after all? Need might be demand, and not in the sense of basic needs, but in the sense of a society, its industry, and the socioeconomic interests that get communicated to us publicly, privately, and in any digital space with an ad-based revenue model. Essentially we’re talking about the need for consumers to consume. For industry to grow and tech to grow with it and for consumers to continue their habit of being subjects, semi-public subjects, in contemporary society via semi- public consumption. The glass ball works maybe not so much, but the furniture works are the product of Kaspar being a consumer. He goes through the motions of your everyday, somewhat design-inclined, bourgeois bohemian furniture shopper. He made an at least half-assed investment of time and energy into getting a sense for what people like or liked and buy or bought, for what genres are out there, and how he might be able to get a hold of certain pieces. An air mattress — Walmart, duh. One Spaghetti chair by Belotti, a Saarinen chair for Knoll, an Eames table. 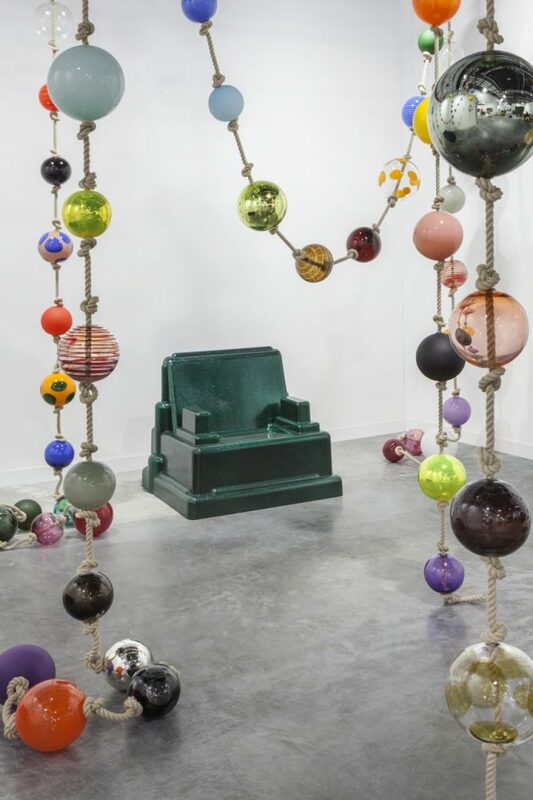 This metallic green fiberglass throne – omg one of the founders of the Memphis group – did you see Bowie’s Ettore Sottsass stuff for sale? He knew. And a shabby chic white wooden chair. It just screams ‘studio’. Or ‘Berlin’. Or ‘Airbnb’. Anyway, anything other than ‘corporate campus’. Yea, so Kaspar went through the motions and researched these things and bought them or borrowed them. He could do the same thing again and again and fill any space you throw at him. The result is kind of homey and kind of a furniture store showroom. Kind of 80s, kind of 2000s, kind of now. It’s kind of tasteful, but is it really taste if it’s something so standard you can pick it up at shops in ‘fun’ neighborhoods in most major cities? I mean, Kaspar’s here is not even such discerning taste, because it accomodates pretty much everything. (Like a Pinterest search for ‘furniture’.) This design classic can make that IKEA shelf fade into the background or look totally natural, very contemporary. And then there’s the idea that of course IKEA shelves or whatever are historically specific and also aesthetically specific and will ultimately have some historical and aesthetic value, if they don’t already. The whole group of works can accommodate knock-offs and pieces that have seen better days just as well. A knock-off or a chaise longue missing its signature cover is just another in this chain. Everything’s connected because they’re all of a type, so as long as that holds true, isn’t overpowered by some other quality or story or significance, then this one fits, and that one too, and that one. I recently started to ask myself whether this isn’t some kind of contemporary sublime – in an era of staggering manufacturing capabilities, an infrastructure wherein conspicuous consumption makes inconsistency in terms of quality and insufficient functionality irrelevant through sheer number of offerings and speed. Where the uneven distribution of resources or poor working conditions or socioeconomic (and sometimes political) inequality are if not obscured as least eclipsed by the drive to grow and consume and upgrade possessions. Divine excess and staggering choice and utter banality. Referring to a series of digital photos he took of Lake Zurich (10,000 and counting), Kaspar described “a mirror in which you search for deeper things, but just reflect yourself.” Face to face with a work that refuses to give any more, that at most could be related to a few sentiments that lead nowhere, he admits: “The rejection of depth would almost amount to aggression.” The anonymously authored website Contemporary Art Writing Daily calls the result “a wall between you and Kaspar like a guillotine”. They talked about Kaspar’s furniture works as a method for producing yet another “extreme of blankness”. So we stare baldly at a real, widespread sense of desire, demand, need? And sense the insatiability, the profound endlessness, the categorical absurdity. The glass balls are unlikely to be such a familiar form. They too, though, are obvious and potentially endless. Kaspar says he likes the idea of lists because you can add an item or take one away, but as long as you maintain a critical mass of items, you still have the list. 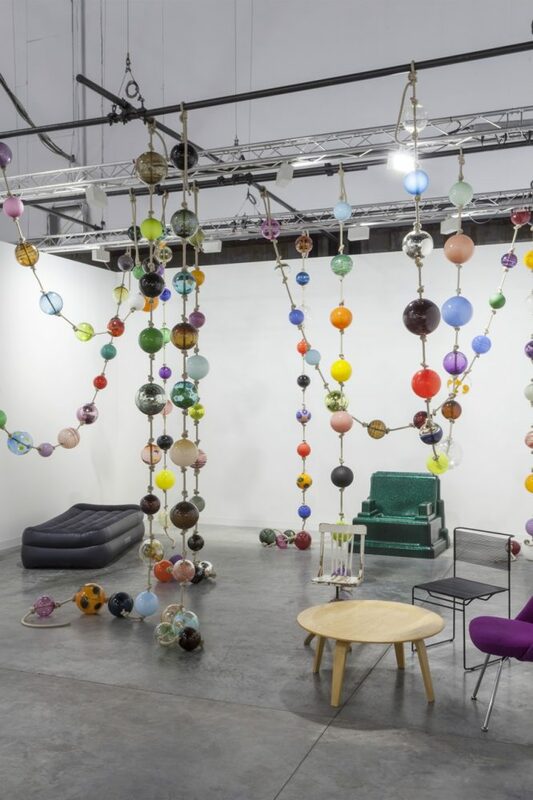 The handblown glass balls strung casually on pieces of rope – with knots between the balls – function similarly. Within the system, each element is treated the same. The balls’ colors and effects have effectively endless possible permutations. The rope could be endlessly long. The balls’ order could be endlessly permutable. And ultimately, the object is endlessly banal. 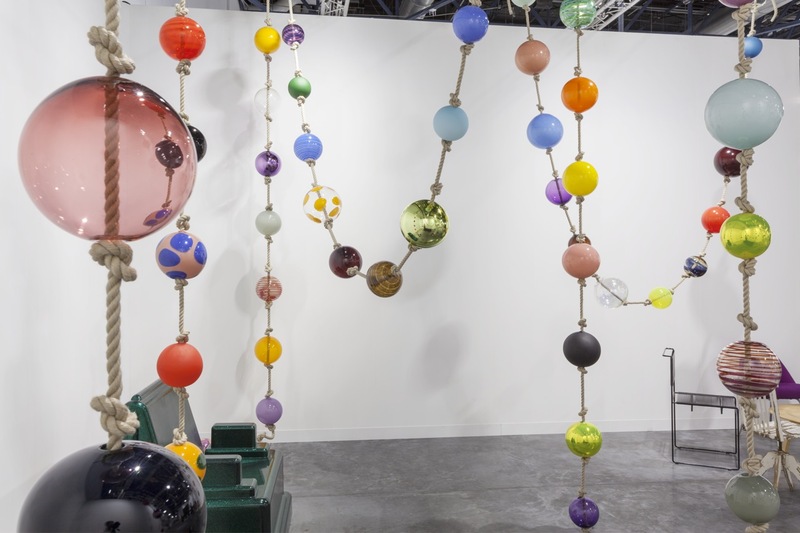 As I said before, Kaspar’s means of production are no secret: These glass balls were blown by Esteban Salazar in New York according to a traditional method in combinations of colors and effects specified by Kaspar. In fact, the balls are exceedingly beautiful if utterly useless for anything other than decoration. 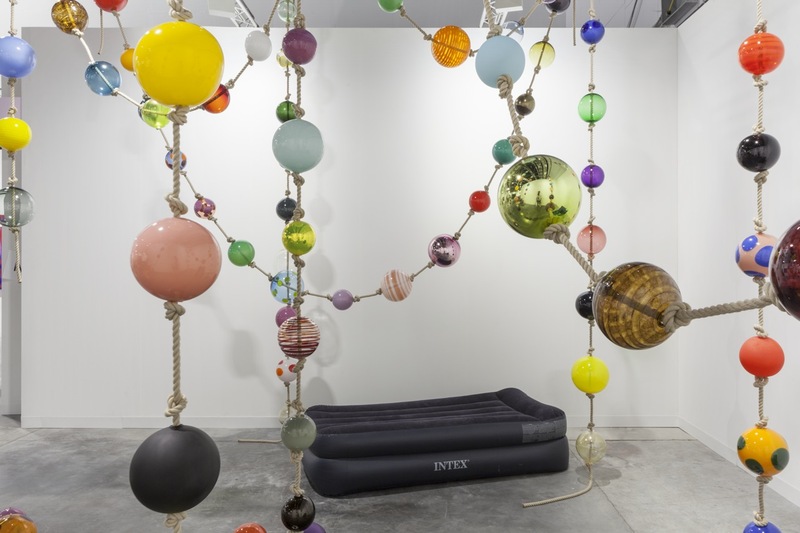 The exasperating insistence of these works – both the furniture and the glass balls – is part of their mystery. They could go on and on. Their mystery is also the result of the unspectacular reskilling involved in their creation. And a product of the insufferable genericness that such hi-tech, resource-rich, global industries – as in the case of the furniture – and such traditional, detail-oriented cottage industries – as in the case of the glass balls–are surprisingly still capable of. Material may tend towards entropy, but goods and their markets apparently tend toward banal homogenization. Still, from something so familiar, so obvious, and so exceedingly banal – something that requires superlatives to describe. This project was supported by Pro Helvetia.